Just as “The Tacoma Method” of expulsion of its Chinese residents was distinctive for its reputed orderly process and self-proclaimed avoidance of violence, the Tacoma effort at reconciliation of the expulsion as a tragic event in the City’s history offers a distinctive model. “The Tacoma Model” is the construction of a waterfront Chinese-garden park that in design, signage, and location recalls the event and provides a significant space for both reflection and recreation. 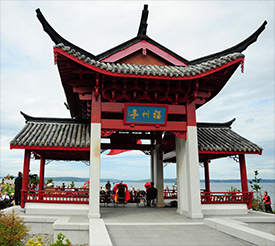 The Chinese Reconciliation Park, opening in late 2010, is an achievement of the City of Tacoma in concert with the Chinese Reconciliation Project Foundation (CRPF) over many years of development. The CRPF began as an advisory committee of citizens brought together in fall 1992 by the City of Tacoma in acknowledgment of the expulsion of its Chinese residents in November 1885. A year before the inauguration of the committee, Dr. David Murdoch had formally submitted a suggestion to the City in response to its call for ideas about the development of the waterfront. Dr. Murdoch, a therapist, proposed a plan to recognize and reconcile the expulsion as an act of disharmony in the history of Tacoma. Specifically, Dr. Murdoch suggested the establishment of a waterfront park with a Chinese cultural motif in a place not far from where houses and shops of most Chinese in Tacoma had stood at water’s edge before the expulsion and the property destruction that came in its wake. During more than a year of regular meetings under the auspices of the City, the committee formed a vision of reconciliation to advance Tacoma into the future as a community sustained by the ideal of civic harmony among people of many heritages. This vision included first and foremost the creation of the park, which would commemorate the Chinese expulsion event of the past and also look ahead to the future as a Tacoma landmark with ever new meaning in changing times. Alongside the development of the park as a significant public space would be efforts, as appropriate, to educate the Tacoma community about the exclusion of the Chinese and to promote multicultural inclusiveness. On November 30, 1993, the Tacoma City Council approved a resolution to allocate $25,000 for preliminary planning of the park on the former Washington State National Guard site along the waterfront near Old Town. A brief formal ceremony in August 1996 officially marked the transfer of the land to the reconciliation park project. The park site is less that one-half mile from the former Chinese settlement along the water closer to downtown Tacoma. While continuing to work with the City, the original citizens advisory committee reconstituted itself as an independent foundation in February 1994; and in June 1995 the CRPF officially earned 501(c)3 status as a nonprofit organization. Over many years the Foundation and the City proceeded through stages of park development, including site exploration, design, and the acquisition of both monetary and other support from both public and private sources. On August 19, 2005, the Foundation hosted a groundbreaking event for the citizens of Tacoma as a preface to construction that would begin later. In the half-decade that followed the groundbreaking the park moved forward with benefit of funds from the City and grants from the State and also local nonprofit organizations. Site cleanup finally led to the start of construction in 2007, and in late fall 2010 the park will open with the completion of Phase I and Phase II of the overall plan for the park. Phases III and IV, to include facilities for educational and cultural functions, remain in view as the ongoing work of the Foundation and the City. One important part of the park is a structure that in itself will be a landmark, the “Fuzhou Ting.” This is a small pavilion, or open-walled building (ting in Chinese), that is a gift to the City for the park from the City of Fuzhou, Fujian province, China. The Fuzhou Ting is an act of friendship between Fuzhou and Tacoma in recognition of their Sister City relationship and grew from a meeting inFuzhou between a delegation from Tacoma and the Deputy Mayor of Fuzhou. Chinese engineers constructed the Ting in Fuzhouand then disassembled it for shipment to Tacoma. With leadership and hard work provided by a team of three senior construction engineers and an interpreter sent from Fuzhou in summer 2010, the reconstruction of the Ting on site in the park is a particularly vivid representation of the park as a significant space of commemoration and reconciliation. The realization of the Chinese Reconciliation Park is the work of staff in the City’s Community and Economic Development Department and members of the CRPF Board. It represents the steady commitment of individuals acting in groups and independently, and it has had the advantage of contributions by Board members and others who have given generously in the form of memberships and other monetary donations. Some companies and individuals graciously have provided goods and services for specific events or general purposes toward construction of the park and the fulfillment of the Foundation’s objectives. Throughout, from the beginnings of the project with the formation of the citizens advisory committee until the moment of the park’s opening and beyond, the project has had the wise and enthusiastic leadership of Theresa Pan Hosley, a Tacoma businessperson who is a well-known leader in the community.